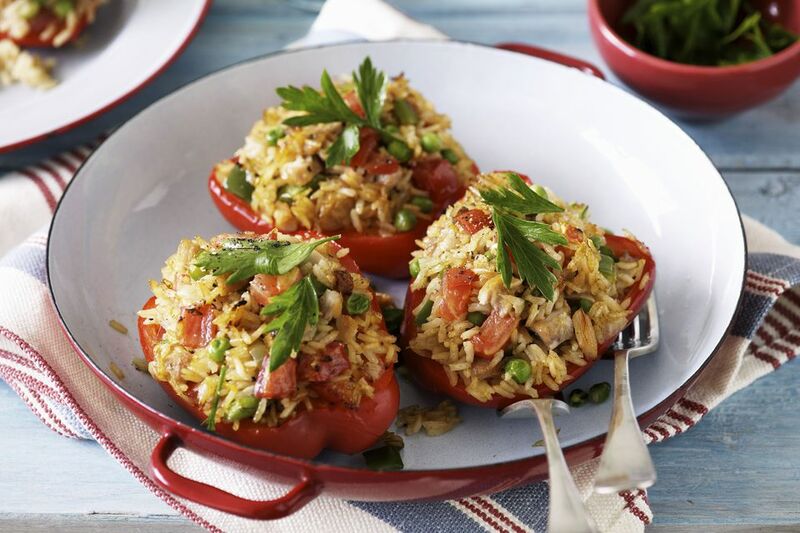 A chicken and rice mixture takes everyday stuffed peppers to new heights. A combination of mayonnaise and a little curry powder binds the filling ingredients together deliciously. The stuffed peppers bake to perfection in only 30 minutes. It's a nice alternative to the classic beef and rice stuffed peppers, and the dish is lower in fat and calories. Leftover turkey, tuna, salmon, shrimp, or even ham can replace the chicken in these stuffed peppers, or use a combination of ham and chicken. They would be excellent with some shredded cheddar or Swiss cheese melted over the top. Sprinkle shredded cheese over the tops just before they come out of the oven, or sprinkle them with grated or shredded Parmesan cheese just before serving. You can omit the onions if you aren't a fan, or use green onions or shallots for milder onion flavor. The pimientos add color and flavor. If you don't have pimientos, feel free to use diced roasted red peppers or some chopped red bell pepper. Cook the rice following the package directions. Fluff with a fork and set aside. Heat the oven to 350 F (180 C/Gas Mark 4). Grease a shallow 2 1/2 or 3-quart baking dish. Cut the tops off peppers and carefully scrape out the seeds and ribs. Put the peppers in a large saucepan and cover with water. ﻿Place the pan over medium-high heat and bring to a boil. Reduce the heat to low, and simmer for about 8 to 10 minutes, or until the peppers are just tender. Drain well. In a medium bowl, combine the cooked rice, chicken, celery, onion, and pimiento. In a separate bowl, combine the mayonnaise, curry powder, salt, and pepper. Gently toss mayonnaise mixture with rice and chicken mixture. Taste and adjust seasonings, as desired. Fill the peppers and place them in the prepared baking dish. Pour about 1 cup of hot water into the baking dish, or just enough to cover the bottom. Bake in the preheated oven for 30 minutes, or until the peppers are tender and filling is hot. If one or more peppers are somewhat lopsided and won't stand up, crumple a small sheet of foil to make a "stand." Nestle a stuffed bell pepper in the foil and place it in the pan. For smaller portions, slice the peppers in half lengthwise. Remove the seeds, ribs, and stems and proceed with the recipe.